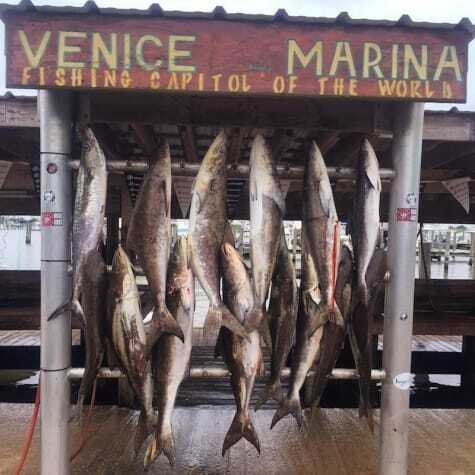 "When you think of Venice the first two things that come to mind are Tuna and Redfish...there are so many other great species"
When you think of Venice Louisiana the first two things that come to mind are Tuna and Redfish. Although there are so many other great species that frequent these waters in great numbers. Add to that the bag limit on most fish and you are sure to fill the boat with an awesome catch. "I hear some drag peeling out from the front of the boat, this was the right species!" For instance the other day it was to rough to get offshore to chase the yellowfin. So we ran to some of the near shore rigs that are in calm waters due to the lay of the land. We were after Cobia and with the LA state limit of two per person that would be enough to fill some coolers. We pulled up to the rigs in 40'-80' of water and pitched some jigs, fishing different depths in the column. Right off the bat is was game on. First fish wasn't our targeted species but is was a big Bull Red over 40". During the release I here some drag peeling out from the front of the boat, this was the right species, and when he came up he had three of his buddy's with him. Only one of them ate for us, but we were definitely off to a good start. We ended up pulling 5 off that rig along with some stud Jack Crevalle, Red snapper and kingfish. We bounced over to the next rig, about a 1/4 mile away and started pitching again. This yielded almost the same results and within an hour and a half we had our Cobia. What to do for the rest of the day was easy, clean some fish, have a cocktail and wait for dinner! Venice is not just tuna town.